2013-14 - A Cool Summer but a Warmer One to Follow? While the 2013-14 summer was cool, satellite data show that conditions have been developing that could lead to a warmer summer in 2014-15. Neutral ENSO conditions continued in the Pacific through January to May but the eastward propagation of an intense wave of warm water, known as a Kelvin Wave, across the tropical Pacific Ocean over the past several months, has led to a 70-80% probability of transition to El Niño conditions by spring 2014. If the ocean systems move from neutral to strong El Niño conditions, then we can expect the weather patterns to change to bring warmer dryer summers. In this case there is the potential for a warmer than normal 2014-15 summer with associated increase in coral bleaching risk. The last big El Niño event was in 1997-98, which resulted in worldwide high summer ocean temperatures and resulted in a global coral bleaching event. While the systems that drive this are still forming and what they will do is still uncertain, it is important to understand that cool summers, which protect corals, are the exception not the norm. The ocean data from Thursday and Masig (Yorke) Islands showed that conditions for the 2013-14 summer were generally cooler than the long term average. The ocean temperature data for Thursday Island (Graph One) show the daily average temperatures as a red line on top of the long-term (15 years of data) average temperature (purple line) and the limits of normal temperatures (blue line – maximums, green line minimums). Graph One. 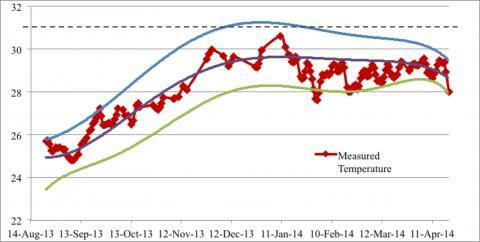 Ocean temperature data from Thursday Island (red line) plotted against the long-term mean (purple line) and the upper (blue) and lower (green) limits of the normal temperature range. The data shows that ocean temperatures were close to normal for most of the early summer period with just a few hot spells in early December and again in early January. Temperatures then cooled with cooler than average temperatures during early February and cool conditions lasting until early April. The rainfall data for Thursday Island little early rain with a late monsoon arriving in mid-January and the first significant falls in late January, the peak being 170mm on 30 January. Masig Island had significantly less rain than Thursday Island with only 730mm falling for the period versus 1,840mm for Thursday Island, but the rain was more evenly spread with some early summer rain in November and early December. Satellite data from NASA’s Moderate Resolution Imaging Spectroradiometer (MODIS) confirms the generally cool conditions with the image from January showing a few minor areas warmer than the average and no overall ‘hot-spots’, that is areas with above average temperatures. What data from a range of satellites does show is the occurrence of widespread hot-spots over the central and eastern Pacific with large areas of warmer than normal ocean water both at the surface and below. This is being driven by the equatorially-trapped Kelvin Wave that reached the west coast of South America in April and is shown by changes in ocean height across the Pacific (below). This type of pattern is characteristic of the early stages of an El-Niño pattern with a 70-80% chance that the El-Niño pattern will form by the end of the year. If the system moves from its current neutral conditions to El-Niño conditions then we can expect, from previous events, to see warmer dryer summers and with this an increased risk of coral bleaching. Figure 2. 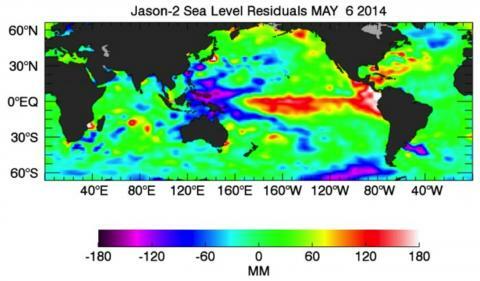 Data from the Jason-2 satellite showing changes in ocean height (sea surface height anomalies) across the tropical Pacific Ocean due to the eastward propagation of an intense wave of warm water, known as a Kelvin Wave. The leading edge of the equatorially-trapped Kelvin Wave reached the west coast of South America in April and is shown by positive changes in ocean height (red-white), resulting in positive temperature anomalies over much of the eastern tropical Pacific. Negative surface height anomalies (black-pink-blue) are evident in the western tropical Pacific, associated with cooler-than-normal ocean temperatures. This type of pattern is characteristic of the early stages of an El-Niño pattern. While this event is still forming (and may yet dissipate) and we don’t know the potential impact at this stage, there is a need to increase our awareness of potential high temperature events, and the impacts these may have, for this coming summer and potentially those that follow. Assessing Alternative Strategies for Weed Management: Containment Versus Eradication? 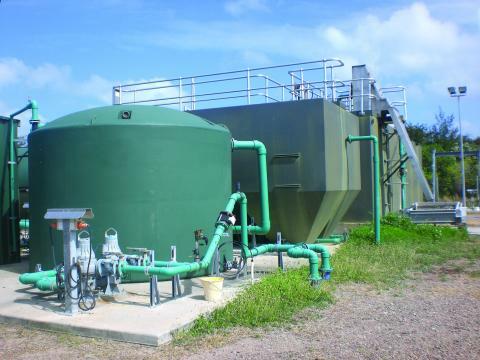 Containment is a frequently advocated strategic objective for countering plant invasions. The goal of containment is to prevent establishment and reproduction of a species beyond a predefined area, whereas eradication aims to remove all individuals of a species. Containment is often perceived as a valid fallback option when eradication has failed or is deemed impossible with the available resources. However, many infestations are likely to be no more amenable to containment than eradication, because the ecological drivers that determine containment success are the same as those that limit successful eradication, e.g. seed-bank persistence, dispersal mechanisms and capacity, and detectability. CSIRO Tropical Ecosystems Hub researchers in collaboration with QPWS (Project 7.2 Invasive species risks and responses) have been using modelling approaches to understand where, why and when land managers might shift their management focus from eradication to containment. We have undertaken a net present value analysis of the costs of eradication and containment and derived rules to guide land managers in determining (1) the circumstances under which a containment strategy is likely to be more effective or efficient than an eradication strategy, (2) the effect of a ‘breach’ (i.e. establishment or reproduction outside predefined management areas) on each type of management strategy, and (3) the situations in which containment would form a valid fall-back strategy for a breach in an eradication program. While containment has one major advantage over eradication, in that a smaller area can be managed, this must be balanced against its disadvantage; that it must continue indefinitely. Our modelling results show how different invasions will be more effectively managed by either eradication or containment based on the soil seed longevity, the discount rate, and most importantly, the size of the infestation relative to the width of the buffer zone which is defined by dispersal capacity. 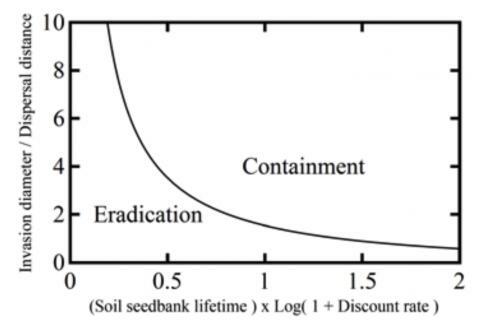 Thus, invasive species with long soil seed bank lifetimes in economic systems with high discount rates will tend to be better managed with containment than eradication. Crucially, there is a threshold invasion size below which it will be better to eradicate than contain, and above which the opposite is true. Our research also clearly shows that the two management strategies incur very different additional costs if they experience an unexpected breach. This suggests that a consideration of the likely types of breach in a given system may provide further support for either eradication or containment, but also that automatically accepting containment as a default fall-back for a breached eradication program is not valid. Figure 1. Zones of eradication and containment. When the invasion diameter is small relative to the distance over which seeds are dispersed, eradication is likely to be cheaper than eradication over the long term. When seeds are long-lived in the soil or the discount rate is high, containment is likely to be cheaper than eradication. Figure 2. 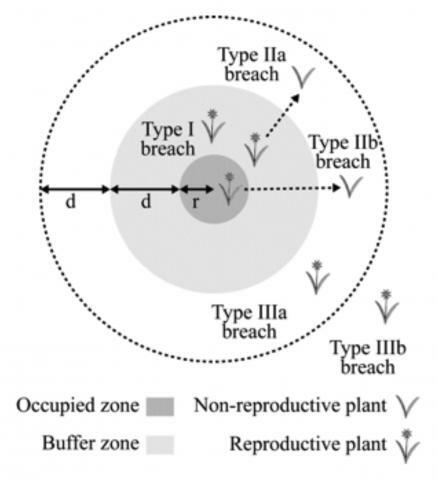 A simple model of weed management and possible breaches of containment. The radius of the occupied zone, r, is comparable to the size of the invasion. The width of the buffer zone, d, should be related to dispersal processes of the invader (Fletcher et al. 2013). The Torres Strait is a region dominated by marine environments that provide resources for local communities and have important social and cultural values. The condition of marine water quality can influence marine foods, human health, marine ecosystems and ecological processes in the region. Previously, no detailed water quality hazard analysis was done for the region, however, potential issues were identified, including regional pollution linked to mining, port developments and land clearing, primarily in Papua New Guinea; more localised pollution from sewage and stormwater discharge; and pollution directly and indirectly associated with shipping, including marine infrastructure. A Tropical Ecosystems Hub project lead by the TropWater team at James Cook University described all existing and potential sources of pollution and associated risks to the Torres Strait marine environment and public health. The information was documented to facilitate uptake of findings to key research users, and to design a basic monitoring program that measures the success of pollution management in the Torres Strait. The project team developed a hydrodynamic model to better understand the dispersal of different water borne pollutants and the associated risks as many of the pollutants are large scale and mostly derived from outside the Torres Strait region. The model revealed variable flushing, including highly energetic small-scale flow dynamics near shoals, reefs, islands and passages, while water tends to stagnate in other areas where pollutants, including metals, may accumulate. The project found that, whilst there are a number of local pollutant sources that may pose a risk to marine ecosystems and foods in the Torres Strait, the largest threats come from beyond the region and are compounded by the potential risks associated with the transit of large ships. Information on the current status and future potential of pollutant sources in the region is now available in a spatial database. Tropical Ecosystems Hub researchers are working in collaboration with Girringun Aboriginal Rangers to increase current knowledge of the distribution, habitat associations and potential threats to inshore dolphins and dugong. This collaboration has arisen due from a desire to record existing Indigenous knowledge of these threatened species and to integrate this with contemporary scientific knowledge. The collaboration involves the team from Project 1.2: Marine wildlife management in the Great Barrier Reef World Heritage Area training rangers in contemporary scientific survey methods for broad scale comparison across northern Australia where other Indigenous ranger groups are actively looking for inshore dolphins, dugongs and other marine wildlife using similar methods. Girringun Aboriginal Rangers are now independently monitoring their sea country for inshore dolphins and dugongs. In the most recent survey, the rangers and JCU researcher Dr. Helen Penrose retraced established transects in Missionary Bay, Hinchinbrook Island. Bandjin clan (Hinchinbrook Island) Traditional Owner, Russell Butler, says the language name of Missionary Bay is Muramalee, or ‘place of the rainbow’, and Hinchinbrook Island is called Munamudanamy. “Muramalee is a very important feeding habitat for dugong and dolphins since Cyclone Yasi in 2011. Herds of several hundred dugong were sighted during November 2013”, he said. The survey recorded the location and behaviour of pods of humpback dolphins, bottlenose dolphins, and individual sightings of dugongs and turtles. However, snubfin dolphins remained elusive. Interestingly, there have been very few snubfin dolphin sightings compared with past surveys and knowledge shared by Girringun Traditional Owners and rangers. Data collected by the Girringun rangers during these regular, independent sea patrols has proved very important as re-capture data now exists via the photo identification of dorsal fins. Photo identification will continue to be used to investigate dolphin abundance and movements in Girringun sea country. On a regional scale, it is hoped that the results of this collaboration will contribute to a national assessment of the status of the Australian snubfin and Indo-Pacific humpback dolphins. On a local scale, the dugong and dolphin data feeds directly into Girringun sea country planning and management, including Traditional Use of Marine Resource Agreements. JCU survey leader, Isabelle Beasley, acknowledges the Girringun Aboriginal Corporation, Girringun Traditional Owners, Girringun TUMRA Coordinator (Cheryl Grant) and the Girringun Aboriginal Rangers for their continued support of this project. Local and global changes are creating new pressures in remote Torres Strait island communities, including substantial increase in the cost of living. The changes are primarily associated with climate change, resource development in Papua New Guinea and disease and biosecurity threats. There is, consequently, strong interest among Torres Strait communities in increasing their resilience so that they can not only cope with the full range of interacting changes but proactively respond to new opportunities that change creates, such as sustainable economic development. CSIRO Tropical Ecosystems Hub researchers from Project 11.1 ‘Building Resilient Communities for Torres Strait Futures’ joined forces with James Cook University, Torres Strait Regional Authority, Torres Strait Islands Regional Council and other research users to establish a participatory strategic planning and social learning approach to help a number of Torres Strait communities understand and enhance their resilience and adaptation skills to tackle likely future scenarios. The project involves envisioning the future, valuing and estimating impacts on ecosystem services, identifying steps that communities can take to reach their desired visions for the future, and developing ‘no regrets’ strategies that do not undermine existing sources of community resilience or the ecosystem services on which they depend. Four workshops have been completed to date: a regional-level stakeholder workshop in Cairns in 2012, and community workshops on Masig (July 2013), Erub (August 2013) and Mabuiag (January 2014). At each workshop, four alternative scenarios were developed and illustrated by participants along with sets of adaptation strategies that were considered robust regardless of which scenario actually unfolds. Scenarios were designed around two key drivers of change considered most important by participants. Though developed independently at each workshop, these drivers were invariably defined as: 1) strength of Torres Strait Island or community culture (strong vs. weak) and 2) the nature of socio-economic development at national and global scales (focused narrowly on economic growth vs. focused on sustainability and ‘green’ growth). In May 2014, the team will return to Masig to conduct a follow-up workshop focused on the community’s resilience to more specific pressures and will work through strategies to respond to unexpected shocks the future may bring. An integration workshop will be held in July that will bring together representatives from all the workshops held to date to cross-check the feasibility of strategies identified in the respective workshops, explore innovative ways to implement these strategies (i.e. aquaculture, horticulture, ecotourism), and review existing programs in the Torres Strait to support these strategies. In its last phase, the project will focus on training community facilitators to run scenario workshops and showcasing the project through visual products. This project’s expected outcomes for communities and regional stakeholders include information to support adaptation decisions, increased capacity to adapt and avoid maladaptive development trajectories, and support for community adaptation and resilience planning in the Torres Strait. Contact Dr. Erin Bohensky (erin.bohensky@csiro.au) for more information. Australia’s tropical rainforests are not immune to these effects according to a long-term study by Professor Stephen Williams and his team at the Centre for Tropical Biodiversity and Climate Change at James Cook University. Professor Williams says that future predictions of climate change impacts on vertebrates indicate that approximately one third of the vertebrate species in the rainforests of the Wet Tropics World Heritage Area will be severely threatened, one third will be vulnerable and one third will not change or increase. The study’s latest iteration is funded by the NERP TE Hub, and addresses questions of climate change vulnerability and resilience of tropical animals and habitats. The team is developing strategies to help minimise impacts on the region’s unique rainforest and biodiversity using available knowledge, existing datasets and strategic research. Improving our understanding of which species will be most vulnerable, and why, will help prioritise adaptation, maximise the region’s resilience, and maximise the “bang-for-our-buck” in management and conservation. Latest results show movements and declines in some bird and mammal species, matching the predictions made by Williams ten years ago. For example, some rainforest ringtail possums have declined, or disappeared, at the lower edges of their ranges, while increasing in numbers at higher altitude. While such mountaintop species are declining in numbers, and contracting further up into the mountains, some widespread lowland species are expanding their ranges to include mountainous areas. Management may be too late for some populations. In 2005, on one particular mountaintop within the Wet Tropics World Heritage Area (WTWHA), a population of lemuroid ringtail possums crashed after a heat-wave. This possum lives only in cool, misty high altitude rainforests and, according to Professor Williams and his collaborators, has lost the ability to cope with temperatures above 28°C over the course of evolutionary history. Unfortunately for the possums, the frequency, duration and intensity of summer heat-waves have increased over the last 50 years and, during one such event, the temperature rose above that critical level for several hours each day, for 28 days straight. With nowhere to go and no means of cooling themselves the population of possums on that mountaintop declined severely. With such impacts threatening, it is important to understand the role and function of places in the landscape that act as refuges during extreme weather events. These “refugia” are places a species might survive when threatened by changing climatic conditions, although for species such as the lemuroid possum, such havens may not exist much longer. Professor Williams and team have come up with a number of ways to identify and characterise a variety of different types of climatic refugia. For example, epiphytes or spaces under logs will provide some protection for some species, acting as micro-refugia. Larger landscape refugia, such as cool shady gorges, may provide some short-term buffering of heat waves and droughts. Larger areas of climatic stability provide managers with insights that may help conservation planning at the state and national levels. Research on the potential of refugia to help protect biodiversity from extreme weather events, and guide our adaptation strategies, is a vital part of the ongoing NERP projects lead by Professor Williams. 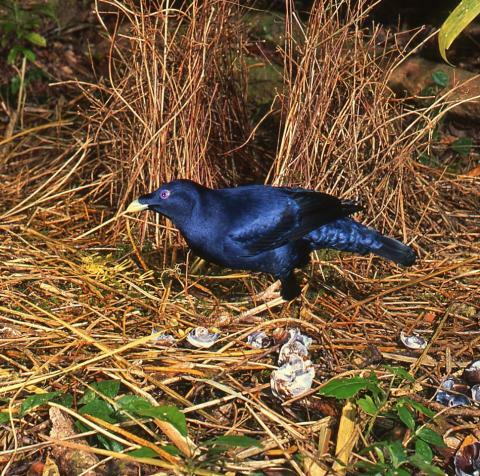 Male Satin Bowerbird. Credit: Mike Trenerry. White Lemuroid. Credit: Mike Trenerry. Torres Strait is home to nearly half of the world’s mangrove species within an area of some 31,390 Ha. However, Torres Strait mangroves are exposed to natural drivers of change, including wind, waves, storms and lightning, more so than mainland mangroves. They are therefore vulnerable to climate-related effects, such as increased storm frequency and severity and coastal erosion. Torres Strait islanders have a long and intimate knowledge of mangrove habitats, reflected in their traditions, culture and long-standing reliance on the basic benefits and resources provided, such as food fishes, wood construction products and medicinal aids. However, the collective species inventory and condition of mangrove habitats among the islands of the Torres Strait has not previously been recorded. Tropical Ecosystems Hub researchers are working in collaboration with Rangers from the Torres Strait Regional Authority’s Land and Sea Management Unit to record the condition of mangrove habitats. The collaborative arrangement is carried out in conjunction with the activity of Project 2.2 ‘Mangrove and Freshwater Habitat Status of Torres Strait Islands’ and forms part of the broader MangroveWatch Program. The collaboration with the LSMU Rangers and their extensive local knowledge has greatly improved understanding of mangrove biodiversity on the islands surveyed; often more than doubling existing species records. The species documented were already locally known, named and used by Traditional Owners. The NERP project includes helicopter surveys, which have covered 463 km of shoreline on 20 islands and collected a georeferenced image database and critical baseline data. These aerial surveys have been validated by boat-based assessments or by shoreline walks at low tide guided by local knowledge. 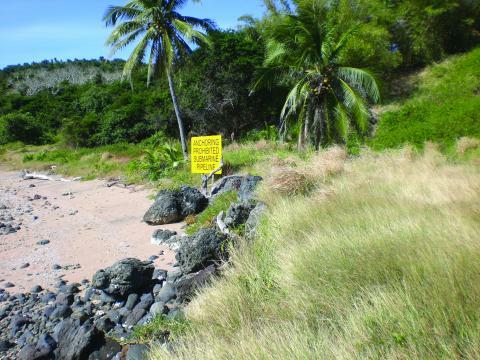 More than 170 km of shoreline on 15 islands have been surveyed by the latter methods since 2012. The impressive spatial coverage of the project has provided researchers with a vastly improved understanding of the overall condition of mangroves in Torres Strait. The aerial surveys indicate that, whilst human impacts are minimal in most areas, direct human impacts on mangroves adjacent to townships were observed, especially localized cutting and pollutant impacts from nearby sewage treatment plants. In a changing environment, it is increasingly important that these critical habitats are well understood and that management of these resources reflects the ecosystem services provided by them. The collaborative and complementary approach combines local and scientific knowledge to build capacity for the management of Torres Strait mangroves in the future. Contact Dr. Damien Burrows (damien.burrows@jcu.edu.au) or Dr. Norm Duke (norman.duke@jcu.edu.au) for more information. Intensive development in the coastal zone adjacent the Great Barrier Reef has led to degradation of coastal ecosystems that threatens the health of the GBR. NERP Tropical Ecosystems Hub researchers from James Cook University are developing new methods of conservation planning based on mapping potential future scenarios to help guide planning for use of the coastal zone. The key economic activities on land in the GBR coastal zone are related to shipping, intensive agriculture, urban development, and tourism. All these activities are set to expand and intensify in the future. Systematic conservation planning determines the best spatial use of limited conservation resources to minimise the loss of valued aspects of the natural world in the future. It is faced with a significant challenge with coastal development because it is difficult to predict so threats to ecosystems and species are highly uncertain. This challenge is increased by the necessity to account for cumulative impacts of all coastal development and activities in the coastal zone. A novel approach is required that integrates the uncertainty of the future and cumulative impacts to identify conservation areas that will be relevant and effective in the future. Project 9.4 develops a new methodology called scenario-based systematic conservation planning. It brings together the research fields of scenario planning, spatial modelling, governance analysis, ecological impact assessments and systematic conservation planning. First, this method uses spatially explicit scenario planning to identify plausible futures to 2035 for the GBR coastal zone. 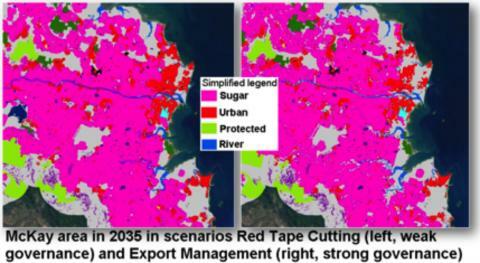 Land use change modelling to map eight scenarios is done using spatial data, on land use, tourism, vegetation and sea level rise. Spatial marine use related to the land use development (e.g. shipping) is added to the scenarios. The scenario maps are used to conduct ecological impact assessments in each scenario on identified environmental assets of the coastal zone such as water quality, seagrass and dugongs. The scenarios will also produce maps of disturbance probability and anticipated transition to urban land use across all scenarios. Comparison of effects of governance systems on impacts on environmental assets is used to conduct governance analysis. Results of these analyses are finally brought together in a systematic conservation planning exercise. 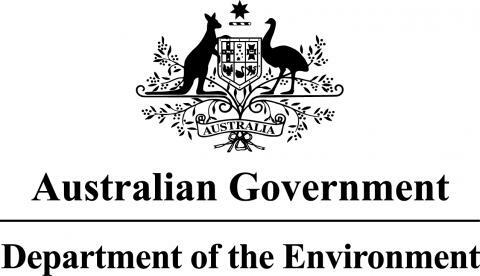 This will assist with prioritising conservation efforts and inform decisions on the most effective use of limited conservation resources and protection measures for the GBR coastal zone. Sharks, giant trevally, coral trout and other large reef predators present a challenge to reef managers. Their mobility complicates estimates of population status, which makes assessment of man-made and natural changes hard to define. In addition, mobility makes the effectiveness of some management practices, including marine protected areas, hard to evaluate. Dr Michelle Heupel is tackling questions of large predator mobility in collaboration with other researchers from AIMS and James Cook University, within NERP TE Hub Project 6.1. Individual sharks and fish have been fitted with acoustic transmitters that are detected by an array of acoustic monitoring stations which record the presence and movement of fish between the coast and the reef, and between reefs. These data are used to define the amount of time individuals spend within marine park zone regions and determine how much protection individuals and populations receive from these zones. To date more than 460 tags have been fitted to reef predators from thirteen different species in the Townsville reefs region and the Capricorn Bunker Group. The team have found a number of patterns in the Townsville reefs data. For example, grey reef sharks don’t move much from home reefs which means that their protection would depend on marine zoning. Bull sharks, on the other hand, move much more within the reef network; into near-shore regions such as Orpheus Island and Cleveland Bay, and alongshore to Moreton Bay; so the time spent in protected zones varies much more. In contrast, blacktip reef sharks have been recorded moving from inshore to Townsville reefs suggesting connectivity between inshore and offshore components of this population. The work continues but early indications are that reef-based marine park zonation will not provide a single management solution for protecting all these highly mobile predators. Instead it is likely that a combination of management measures will be needed to effectively manage and conserve mobile predator species. A tagged blacktip reef shark fitted with an acoustic transmitter. Credit: AIMS. Acoustic monitoring station picking up signals from tagged sharks and fish. Credit: AIMS. Tropical Ecosystems Hub researchers are unlocking vital information for species of coral trout on the Great Barrier Reef that has important implications for coral trout conservation and fisheries management in the World Heritage Area. The team from Project 8.3 Significance of no-take marine protected areas to regional recruitment and population persistence on the Great Barrier Reef is seeking to understand how larval connectivity in networks of marine reserves contribute to biodiversity conservation and sustaining fisheries; and whether the benefits of larval connectivity are influenced by reserve design. The project is focused on two species of coral trout, Plectropomus leopardus and P. maculatus. These species are primary target species in the Coral Reef Finfish Fishery on the Great Barrier Reef and iconic species that are readily associated with the Great Barrier Reef. The project team undertook genetic parentage analysis to track dispersal of larval fish from marine reserves; developed a biophysical model to simulate larval dispersal; and established a metapopulation model to forecast future population changes and fishery yield. A metapopulation consists of a group of spatially separated populations of the same species that have some form of migration or mixing behavior among them. The research provides empirical estimates of larval dispersal within and among three clusters of reefs over 100km apart in the southern Great Barrier Reef region. The research refines an existing biophysical model for this region to better predict regional dispersal; compares observed and predicted patterns of larval dispersal from the biophysical model; and evaluates the effects of marine reserve network design using the metapopulation model. Preliminary analysis determined a degree of hybridization between the two species. Dispersal studies showed both local retention of larvae within reef clusters and significant connectivity among them. Understanding connectivity is critical to successfully determining recruitment dynamics for these important reef species. The findings have important implications for understanding the effectiveness of current spatial management within the Great Barrier Reef Marine Park. This is fundamental to understanding how reserves in the Great Barrier Reef are demographically linked to fished areas and therefore can potentially influence fishery yields. The next stages for this component of the project are to further develop the preliminary metapopulation models to answer questions about whether the establishment of the Great Barrier Reef reserve network has benefited fishery yields in the short- term, compared to a no-reserve scenario. The project team will also consider the effects of marine reserves in the long-term, accounting for the natural habitat heterogeneity and disturbance events. 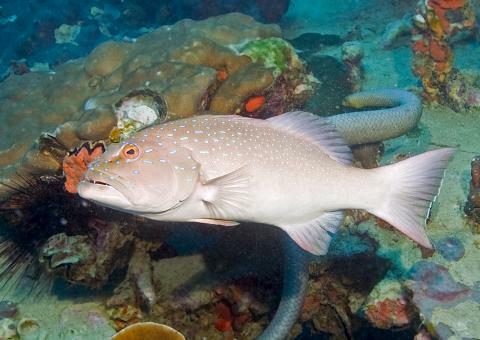 This will provide a holistic understanding of the fishery and conservation implications of the Great Barrier Reef Marine Park zoning plan on coral trout.